Lenovo Flex 2 15D (59418242) is the latest 15.6 touchscreen 2-in-1 laptop with dual mode design that you can use in laptop mode with ergonomic AccuType keyboard and in stand mode at a 300 degree angle for a great Windows 8.1 experience. It has unique features like Rapid Boot Technology for 30 percent faster boot ups, LED backlit anti-glare screen for very clear texts and images, generous amounts of memory and hard drive as well as a decent AMD A8 processor. 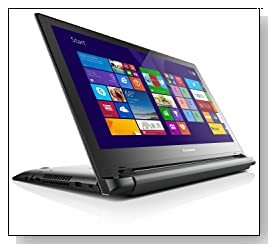 Lenovo Flex 2 15D has an AMD A8-6410 (2MB Cache) quad core processor at 2.0 GHz speed, 8 GB DDR3 RAM memory that lets the user work on several tasks simultaneously, a large 1TB SATA hard drive at 5400 rpm speed for lots of files and the Windows 8.1 operating system. AMD A8-6410 is one of the latest processors by AMD and you could compare it to an Intel i3-4010U..
.. But the AMD A8 has more cores to deal with more tasks better at the same time and it also operates at a higher frequency. It is good enough for daily tasks and being able to work with many at once, thanks to also the 8GB of RAM so you will hardly encounter any lags or freezes. Then you have plenty of storage space as the 1TB is equal to a massive 1024GB so you can save all your videos, photos and other files in one place easily. The 15.6 inch multi-touch HD Active Matrix TFT Color LCD screen has the max screen resolution of 1366x768 pixels, the 16:9 cinematic aspect ratio and AMD Radeon R5 HD graphics that is suitable for photo and video editing and light to medium level games and the screen offers sharp and clear picture quality. It supports 10-point multiple gestures, reported to be quite responsive and is optimised for Windows 8.1 experience. You get rich and immersive sound with deeper bass and reduced distortion through its stereo speakers and Dolby Advanced Audio. 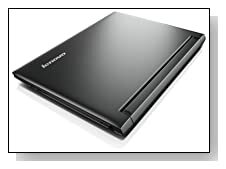 Black Lenovo Flex 2 15D weighs 5.5 lbs with the measurements of 10.87 x 1.06 x 15.04 inches, so it is portable enough. The 2200 mAh lithium ion battery is claimed to give the user between 4 to 5 hours between each charge thanks to Lenovo Energy Manager, also increasing the long-term durability. It has an AccuType keyboard that feels comfy to type on and with 10 key numeric keypad, also a one piece touchpad with a nice palm rest. 802.11bgn wireless, Bluetooth 4.0, Gigabit Ethernet with RJ-45, 2 x USB 2.0 ports, 1 x USB 3.0 port, DVDRW Optical Drive, an HDMI port, Headphone/Microphone combo port and a Multimedia Card. Conclusion: Lenovo Flex 2 15D (59418242) is an affordable laptop considering it is a slim and modern dual mode touchscreen that can be used in laptop mode and stand mode, the AMD Beema A8-6410 quad core processor, 8GB RAM memory for multitasking, 1TB hard drive, a great HD touch display, superior sound and great connectivity options. We haven’t tested this computer but according to a few tech review websites and some customer reviews online, it is powerful enough to handle anything most computer users would do on a daily basis. The AMD Radeon R5 is an integrated graphics card but equal to a budget dedicated card and should let you play many games but not the very demanding ones. So it doesn’t seem to sacrifice on performance and normal laptop specs for the sake of being a fancy 2-in1 and offers good value overall.